There are days when I look at my kids shower and scratch my head. How can two little men make such a mess? It is crazy. Unfortunately all this mess leads to extra cleaning time.Who wants to spend all her time cleaning a shower? I don't know about you, but I don't like to clean. I can think of about a thousand other things that I would like to do. Don't get me wrong; I want a clears house. Personally, I wish that the cleaning would be done by little fairies when I wasn't looking. Knowing that the fairies will never come, I have resolved that my cleaning products need to work quickly and effectively. Recently I have started using the new Soft Scrub Mold and Mildew Stain Remover Gel. I used the Soft Scrub Mold and Mildew Stain Remover Gel on my kids' shower. What I liked best was the gel aspect. With the gel, I knew that my cleaner was working and not sliding down the drain. The gel cleaner was powerful and got the grime cleaned efficiently. Plus, I didn't have to worry about my clothes getting doused with cleaner (how many times have I ruined shirts from overspray). 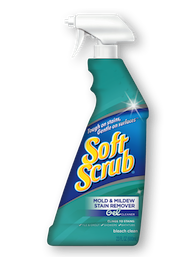 With this new Soft Scrub, I was able to get the shower clean quickly and more onto the other weekly cleaning tasks. Would you like to try Soft Scrub Mold and Mildew Stain Remover Gel? I have 3 product coupons to giveaway. Please use the Rafflecopter to enter. I use diluted bleach in a Spray bottle to kill mildew stains and mold stains. It really works! Put damp beach towels on the clothes line -- stop mildew before it starts! I've used bleach in my cleaning water. I have an overhead fan in the bathroom that I turn on when we take showers and I also use Tilex. Thanks so much for hosting this giveaway! Use bleach, seems to work the best with what I've tried. I wish I had one! Still looking to products like this to solve the problem! I just clean often. If I don't, it gets bad because it's so damp here. Thanks for the giveaway…make sure your bathroom is well ventilated i.e. exhaust fan or window. You may want to upgrade to a more powerful bathroom exhaust fan (The larger the CFM number the better). I use bleach water and a scrubby and I scrub until its gone. I use bleach and a toothbrush.